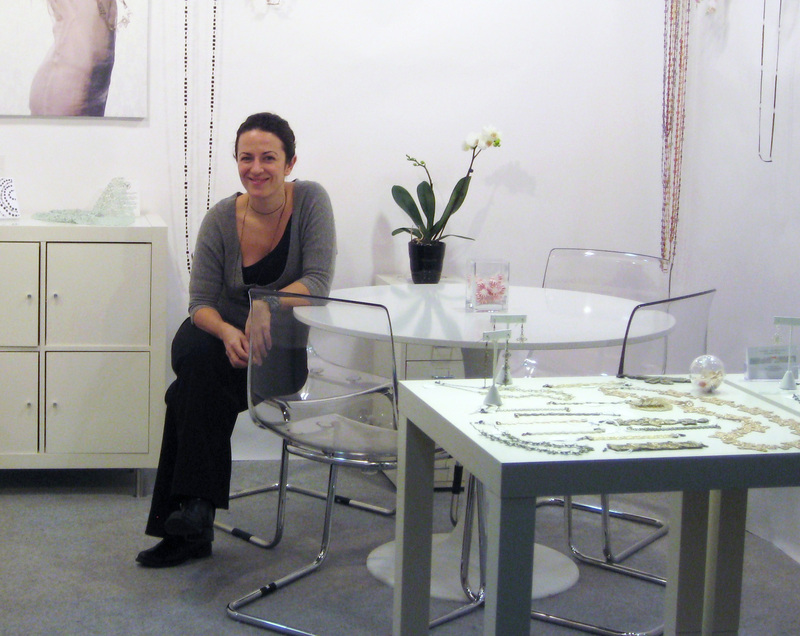 Paz Sintes in her booth during a trade show at the Javits Center in Manhattan, January 2011. Forget bling-bling. Forget chunky necklaces, logos splayed across designer bags, flashy jewels. The biggest up-and-coming trend is subtlety. At least according to Paz Sintes. Sintes, a textile jeweler whose pieces are handcrafted using European vintage laces, strives for a simple, airy lightness that she equates to Fred Astaire’s dance. The Barcelona native moved to New York City with her husband five years ago to explore the “freelancer city” and started selling her collection in boutiques throughout Brooklyn and Manhattan. Then, at her neighbor’s suggestion, she began regularly setting up shop at craft shows. 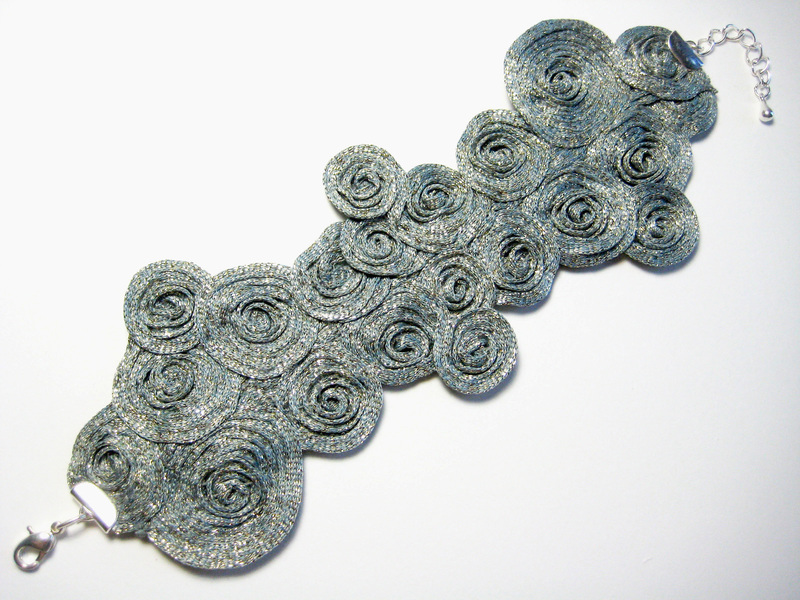 What materials do you use for your jewelry? Mainly high-end European embroideries, like Lurex [a cotton rib-knit fabric]. I also use laser cuts made in Switzerland, vintage laces, and passementary [trimmings of gold or silver cord]. My collection is totally handcrafted; I design, hand-cut, mix, stitch, and dye everything at my home studio in Brooklyn with my assistant, Yulie. For metals, I work mainly with a Japanese supplier of anti-allergenic brass. A “floating” photograph of Fred Astaire hangs in Sintes’ studio, which serves as a muse for lightness and freedom. What distinguishes your work? Its softness and texture. My jewelry moves with you when you move, when you walk. I like to say that my pieces are like Fred Astaire’s music — light, airy, floating. 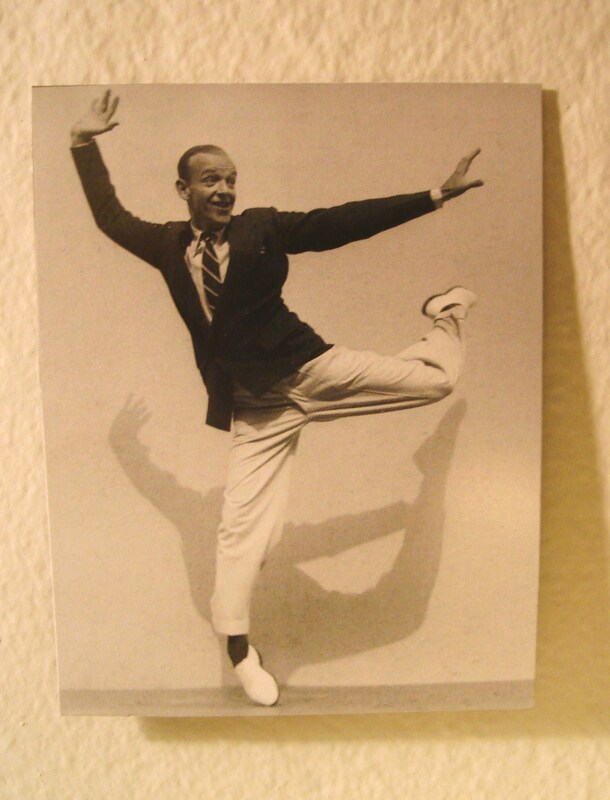 I have a picture of [Astaire] in my studio. The last piece of jewelry you purchased: I don’t remember. I have probably bought 10 pieces in my whole life, and I never wore them. That’s one of the reasons why I started my line — I couldn’t find any accessories that really attracted me. Sources of inspiration: I always take notes in the street. And all styles of music, especially jazz. I sing jazz solos while I work! Working at street fairs across New York City must result in some pretty funny customer encounters. Once, Uma Thurman stopped by my booth at Madison Square Park. She was dressed casually, with no makeup or sunglasses. She was looking at this one necklace, and behind her, other vendors were waving their hands and giving me signals. But I was frozen, just repeating information about French laces and high-end fabrics like a robot. Finally, I asked her, “Are you who I think you are?” She smiled and said, “I used to be! May I take a card?” Then she left very quickly. Another time, an Asian couple spent half an hour debating whether to buy a necklace after I told them the price, which was $395. Finally, they gave me $4 and waited for their $0.05 back. They had thought I meant $3.95, which you can’t even buy a round-trip subway ticket for! They were totally embarrassed when I explained the situation. Describe the woman who embodies your jewelry. She is 40 or older, a wealthy businesswoman living on the Upper West Side in New York City. She is very fashionable, very informed, always searching for new, interesting things. She already wears Tiffany’s, but is fascinated by textile jewelry. How long does it take to complete a piece? Anywhere from two hours to months, depending on the piece. I often need to travel to Europe for my work. French cotton-lurex-poly ribbon hand-stitched bracelet; approximate retail value of $135 to $145. Retail prices: My pieces range from $30 to $400. Favorite designers: My God, there are so many! I love Balenciaga, Lanvin, Romeo Gigli. Lately, some of my favorites are Anne-Valérie Hash and Olivier Theyskens. Best part of your job: Creation is a joyful moment. Then again, artists don’t create, we discover. My friend, who is a composer, always says the music finds me. Another intimate, emotional moment is seeing customers smile when they look at my jewelry. That sometimes makes me cry. Most challenging part of your job: Showing customers that although my pieces look very fragile and airy, they are in fact quite strong. Favorite emerging trend: I think I’m creating one. Trend you wish would go away: In terms of accessories, I hate bling-bling — anything big, shiny, funky, and noisy. I prefer shy, subtler jewelry. In terms of clothing, I don’t like logo-mania. It should be more about material than the logo. 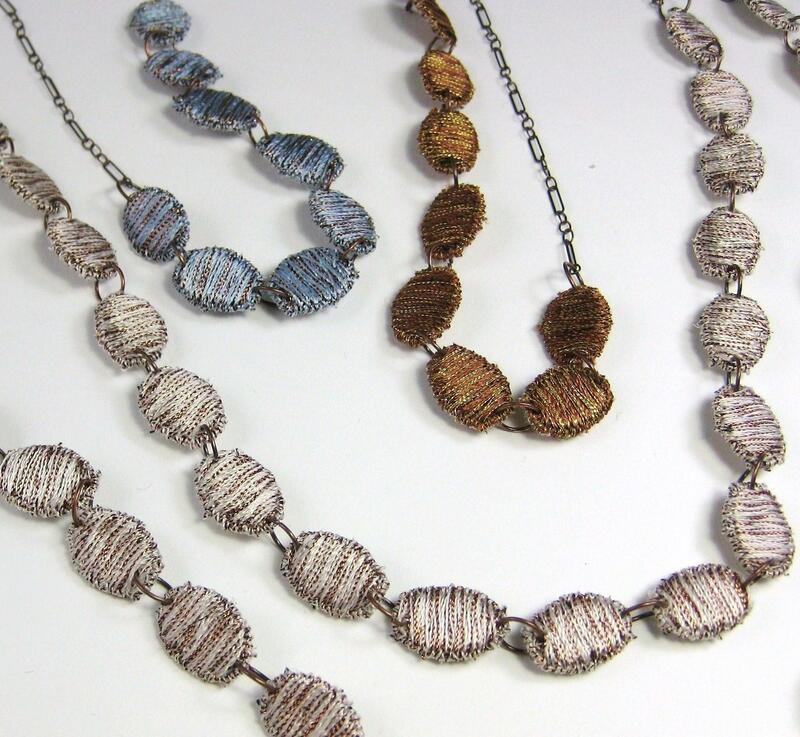 These short necklaces are made with Swiss cotton, viscose, and lurex oval guipures. Approximate retail value of $125 to $135. Your tricks of the trade: I always start out with taking a picture of my materials: the textile, chain, and tools I’ll be using. Then, I take a photo of the finished piece, as a point of reference. I also package all my jewelry in clear plastic “bubbles,” which I import straight from Italy. I have a very artistic vision: designers need to be honest. Consumers already have far too many things, which is why I avoid shopping. Don’t simply repeat things you see. Check out Paz’s jewelry on Facebook, Etsy, and on her personal site, PazSiintes.com. Click here for a list of stores where Paz’s jewelry is sold. This entry was posted in Art and Design, Cool jobs and tagged craft shows, fashion designers, jewelers, jewelry, paz sintes, textile design, uma thurman by Megan Hess. Bookmark the permalink. Great interview and great product! do you know where we can find her stuff? Please reference the last line of the blog post for links to find her jewelry on Etsy and her website.